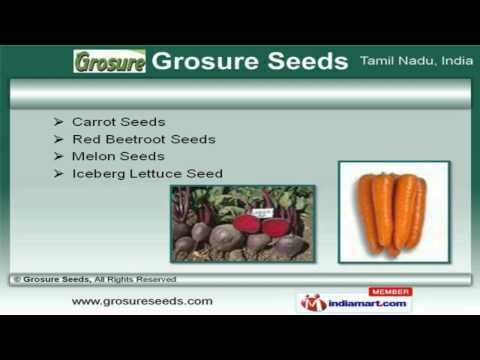 Welcome to Grosure Seeds, Exporter and Supplier of Agriculture Seeds. The company was established in 2012 at Hosur. International quality standards and authentic vendor base make us different from others. Client centered organization, prompt and timely deliveries make us the first choice of our clients. We offer a wide array of Yellow Capsicum, Green Capsicum and Cherry Tomato Seeds. Our Cauliflower, Plum and Fresh Tomato Seeds are best in the industry amongst others. We offer Carrot, Melon and Iceberg Lettuce Seeds that are reckoned all over the world for their superb quality. Batavia, Leaf and Cos Lettuce Seeds offered by us are some of our best selling products. Along with that we offer Kohlrabi and Gherkin Seeds that are extremely reliable. We also provide Capsicum and Plum Tomato Seeds for Agriculture that are in huge demand across the global markets.